TopSpec Cool Balancer is designed for horses and ponies that need extra condition but no ‘fizz’ and that are in light to medium work. Cool Balancer forms the ideal introduction to feeding balancers for those horse owners who are attracted to the idea of giving their horse ad-lib forage balanced by smaller hard feeds. It provides a very palatable, safe and effective way to improve condition and topline without adding excess calories to the diet. Cool Balancer is a ‘Non-Heating,’ cereal-grain-free formula; with low levels of starch and sugar, plus good quality protein. It stimulates weight gain whilst delivering a formula that not only avoids exciting horses but also includes ingredients that may reduce anxiety and help horses relax. Feeding TopSpec Cool Balancer improves the amount of nutrients that a horse can extract from his feed and because the horse can utilise more nutrients from forage the amount of concentrate that needs to be fed can be reduced. This benefits digestion and is a more natural way of feeding, leading to a more relaxed horse. The forage to concentrate ratio is also improved because Cool Balancer is very nutrient-dense. It is fed in very small quantities, for example just 500g (approximately two beakers) a day for a typical 16hh middleweight weighing 500kg. A small amount of hard feed obviously leaves more space in the digestive system for forage than a large hard feed. 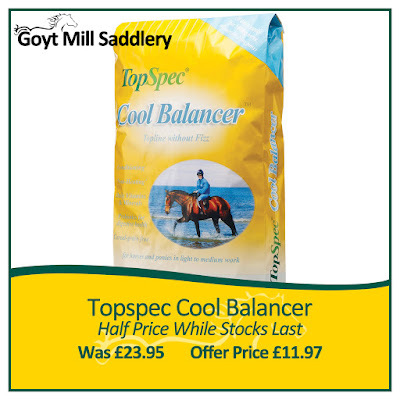 TopSpec Cool Balancer is available in15kg sacks, which last a 500kg horse for 30 days or a 250kg pony for 60 days. Instore Promotion Only. While Stocks Last. Offer ends 31st October 2018.